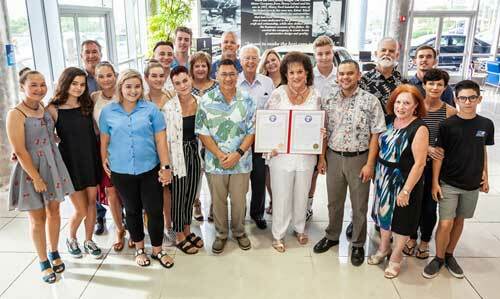 Jones was recognized at the 2018 First Hawaiian Bank and Guam Business Magazine Businesswoman of the Year gala in April. The Lifetime Achievement Award is given each year as part of the Businesswoman of the Year program to businesswomen in the region who have been pioneers, have worked tirelessly to improve the quality of the island community in which they live and who serve as role models for businesswomen of today. Present alongside Mrs. Margaret Jones, were her husband, Robert H. Jones, their children, Julie Jones Murrell, Jeff Jones, Jay Jones, and their grandchildren. Left to right: (front row) - Page Murrell, Jada Jones, Lane Murrell, Jenna Jones, Jasmine Jones, Jessica Jones, David M. Cruz, Jr. (USAF Col., ret. 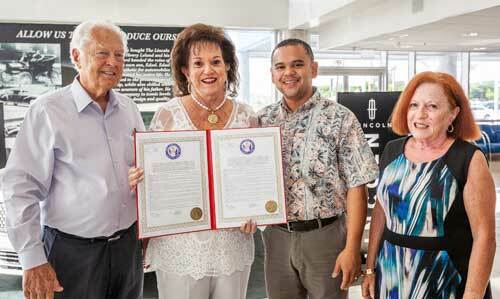 ), Mrs. Margaret Jones, Lifetime Achievement Honoree, Senator Dennis G. Rodriguez, Maureen N. Maratita, Publisher of Glimpses Publications and President of Businesswoman of the Year Inc., Jane Jones and Josiah Jones. Standing in back, left to right: Dan Murrell, Senior Vice President of Triple J Enterprises, Inc., Kai Murrell, Jake Jones, Julie Jones Murrell, Jay Jones, Senior Vice President of Triple J Enterprises, Inc., Robert Jones, Chairman and CEO of Triple J Enterprises, Inc., Deane Jessee-Jones, Jeremy Jones, Jeff Jones, President and COO of Triple J Enterprises, Inc. and Jonah Jones.